Simple to set up. Easy to customize. Free trial. Every month over 1,000,000 people use a store locator created with Blipstar. Sign up and let potential customers find you today. Store Locator software lets your customers enter a zip code, post code, address or place name and get a list of your nearest stores or products, complete with an attractive interactive map and driving directions. Blipstar is the simplest way to enhance your website with a fully-featured store locator or zip code finder. It's simple to set up, easy to use and provides an invaluable service for existing and potential customers. And there's no software to download or install. Just create an account, input address data and choose one of several ways to integrate it with your site. Your locator will work with smartphones, tablets, laptops and PCs and is fully customizable. It's fully compliant with W3C HTML5 standard and we've made it accessible to users with screen-readers and other assisted technologies. Blipstar's hosted store locator software is also really fast to load. We've spent a long time optimizing the viewer code and it's paid off - your store locator loads in milliseconds, one of the reasons why it's been awarded an exceptionally high YSlow grade of 99% and PageSpeed score of 100% (YSlow is an industry-standard web page speed metric and the average score is 75%, PageSpeed is Google's own metric). Creating a store locator has never been easier, better value or more, dare we say it, fun. Simplicity is our mantra - the only thing you need to provide is a spread-sheet. Most businesses already have such data to hand, so it's just a case of changing the column names so the system knows what each column represents (e.g. store name or zip code). Any useful data you want displayed (opening times, logo, images, special offers or notes) can also be displayed. Once your data has been uploaded (or manually input) it's then a case of integrating it with your site. Code snippets and straightforward instructions are provided by the Deploy wizard, so your computer skills don't need to stretch beyond 'copy and paste'! "Can I..?" Yes, you probably can! Every website is different, so most users like to customize their store locator in some way and Blipstar boasts a huge range of settings (over 100 at the last count). Nearly every aspect of how it looks and operates can be altered, tweaked and perfected. 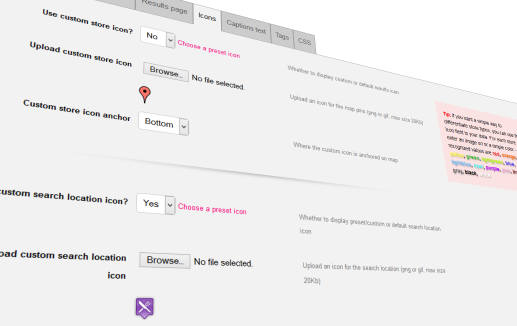 For example you can choose from a range of high quality icons or upload your own, change all the text/wording, alter various search parameters - the list goes on. Advanced users can define their own CSS for limitless flexibility. Best of all, if there's something you'd like to do, but can't, just let us know. If the feature doesn't exist we can add it to our product roadmap and it will appear in the next version. Blipstar is constantly innovating to stay ahead of the competition and our clients play a big part in that process. Your store locator is mobile friendly by design. It's easy to add a store locator to your site, whatever tool you use. Looking for a WordPress store locator add-on? We're not alone in being fans of WordPress - it powers a sizeable chunk of websites across the globe. If you're looking for a WordPress-friendly store locator software then Blipstar makes it really, really easy. If you've mastered WordPress, you can certainly master integrating it with a Blipstar store locator. Seriously, it'll take two minutes max. Find out where your customers are searching from. Most businesses and organizations use analytics to better understand how people interact with their websites. The Analytics module in Blipstar adds an interesting twist by adding the spatial dimension. Each time a customer uses your store finder the location of where they searched is recorded. Over time this builds up a powerful picture of where your customers are. Even better is the fact you can cross-reference this data with your locations and start seeing places where there are lots of potential customers, but no nearby stores serving them. Once your customer's found a store, they need to know how to get there. That's why Blipstar comes with integrated driving directions. The user knows where they are (you'd hope) and, once they've used your store locator, they'll know where you are too. The next logical step is to get from A to B and easy to follow driving (or walking) directions are a great way to facilitate that journey. If you overwrite or mess up your location data - fear not! Everytime you upload data the previous version is saved so you can easily get back to where you were with the minimal of fuss. Data and settings is also stored remotely offsite (in a different physical location) for those worst-case scenarios. Payments are handled separately by secure industry standard payment processors so your confidential info is never stored on our system. A complete list of features is also available. Hosted store locator software provides a convenient way for existing and potential customers to find which of your stores/shops/dealers etc. is nearest to where they live (and how they can get there). They simply enter a zip code, post code or address and the store locator finds the nearest store locations (within a given radius) and plots them on a map. Store locators and Branch locators are a popular feature of many websites but setting up an effective store locator from scratch takes time and effort. So in August 2006, the original Blipstar was born, a store locator service designed to greatly simplify this process - it does the hard work for you! You create an account, upload a spreadsheet of store information (name, address, phone number etc.) and set up some design options. Blipstar then creates your store locator tool and and you simply need to link to it from any web page. No programming experience is required and you don't have to download or install anything on your website. It worked and people were generally happy with it but after a few years it started looking dated and the underlying technology had been pushed pretty much as far as it could go. Looking back on it, as our first major web app we learned a lot and, as always, with hindsight would have done lots of things differently. So a completely new product seemed the way to go and the original Blipstar became "Blipstar Basic". So a new Blipstar was created in response to this, allowing 1000s of store locations and providing a wide range of options for customization, including the ability to integrate the store locator directly into the customer's website. New features are continually added and the site underwent a revamp in late 2011. Improvements included a flexible keyword search, search by US state, text-only search, SmartSearch mapping, a raft of new customization options and integration within Facebook. Quick Add, Quick Edit and Quick Delete functions for making fast changes to your data. A major upgrade - Blipstar v2.0 - was released in December 2012 with a raft of new features and a contemporary look. Every aspect of setting up a store finder has been enhanced or tweaked to make the process even simpler. We hope you like it. Blipstar is also ideal as a UK store locator with full mapping support. Likewise it's perfect for Australian and Canadian store finders. Users from other countries can customize the wording (it has unicode support) and set the map interface to be a language of their choice. UK users or visitors might also be interested in Things to do Near You. Some advanced users wanted even more control and customization over their store locator and not have to rely on a third-party. Blipstar Server was therefore released, a "host-your-own" product effectively allowing a customer to set up their own store locator on their website and expand and customize it to meet their exact requirements. This separation from Blipstar meant that the new version didn't get bogged down in too many features that weren't relevant to most users, but gave developers infinite flexibility. Server is very much a niche solution and Blipstar is the best option for the vast majority of users and organizations. That said, most users have been able to set up Blipstar Server in minutes rather than hours. That said, old-school software like software is a lot harder to maintain meaning Blipstar Server is no longer available so we can focus all our efforts on the hosted version. Blipstar will continue to be developed to keep up with the latest HTML tricks and techniques and ever growing range of mobile devices. A key focus is on marketing and getting the word out to small and medium sized businesses who would benefit from a simple store locator. Watch this space for the latest Blipstar developments! New versions are regularly released (by October 2016 the version was 3.8) and because it's software-as-a-service (i.e. hosted) you benefit from the enhancements straightaway, with no action needed on your part.